Advantages: Beautiful casting; versatile subjects; minimal clean-up required; includes painting masks and detailed instructions. Recommendation: A versatile accessory that will lend interest to military or civilian scenes; or might be the centrepiece for a vignette of its own. Highly Recommended. Many modellers will know Spencer Pollard as long-time Editor of Military In Scale magazine, author, and as a talented armour and aircraft modeller. 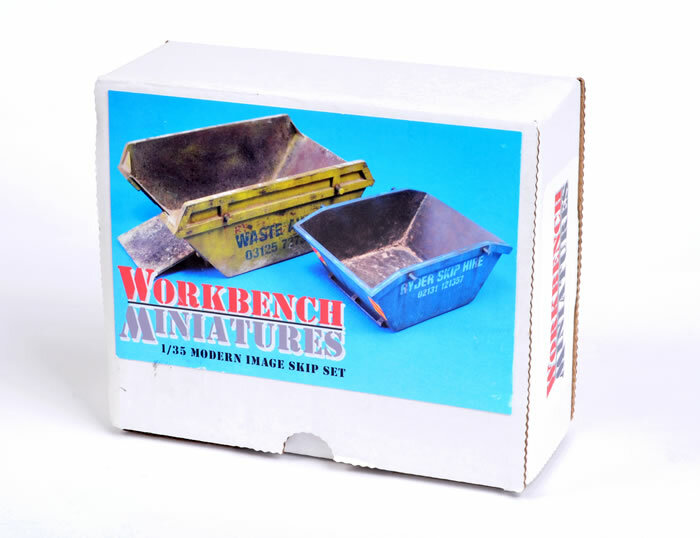 This multimedia Renaissance man has now added another string to his bow with the launch of a new range of resin accessories called Workbench Miniatures. 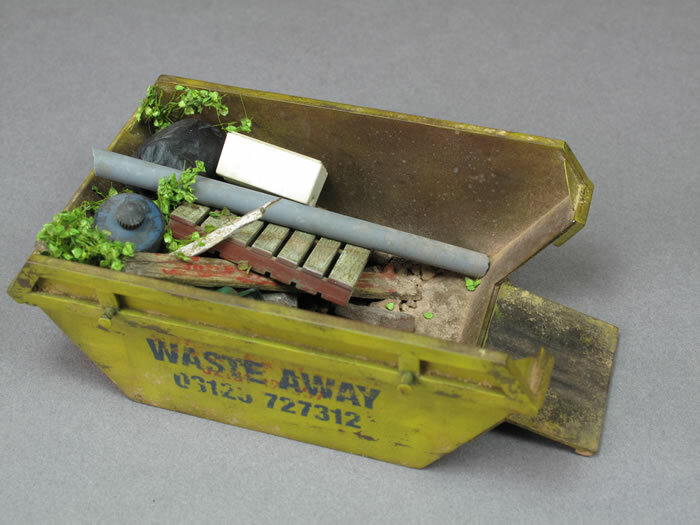 The first Workbench Miniatures release is a 1:35 scale modern rubbish skip set. Two skips of different sizes will be found inside the stout and well-packed cardboard box. They are both perfectly cast in grey resin. 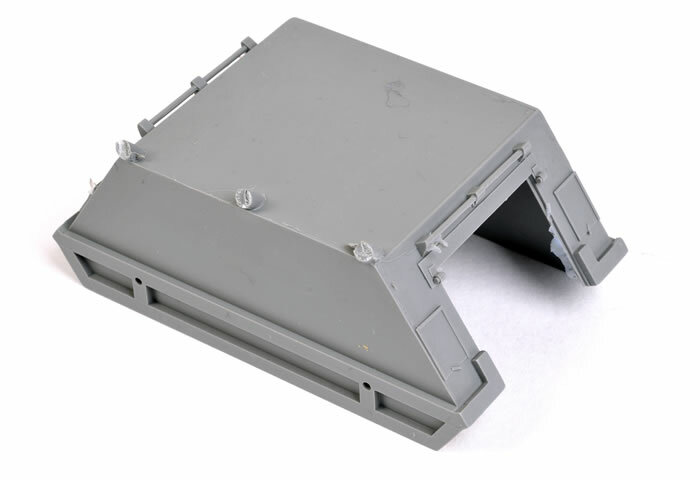 The smaller skip is cast entirely in one piece, while the larger item has a separate drop gate, lifting lugs and triangular reinforcements. The eleven resin parts are beautifully cast. The only clean-up required will be the removal of three small raised casting stems on the bottom of each skip. The smaller parts are cast onto fine attachment points – a sharp hobby blade is all that will be required here. Although construction is almost self-explanatory, a double-sided A4 sheet of colour-illustrated instructions is included. A separate disk is also supplied, which includes a PDF version of the instructions plus a folder of images of the completed skips loaded up with various bits of rubbish. These photos offer some attractive inspiration for modellers. The package is rounded out with a set of self-adhesive “Miracle Masks”. These provide two sets of markings for the skips. 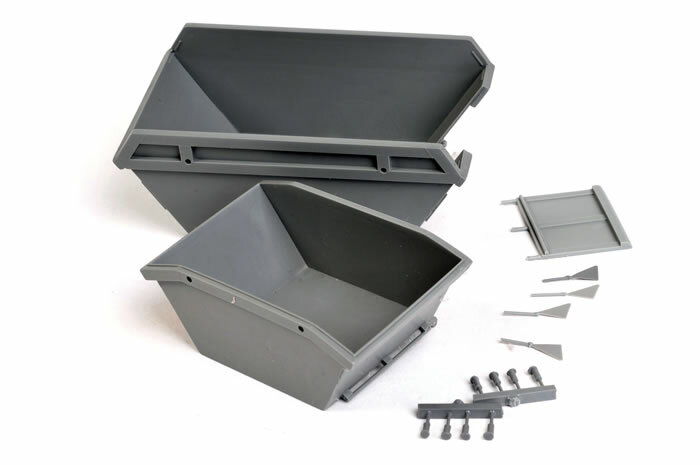 Workbench Miniatures’ Modern Image Skip Set is a versatile accessory that will lend interest to military or civilian scenes; or might be the centrepiece for a vignette of its own. 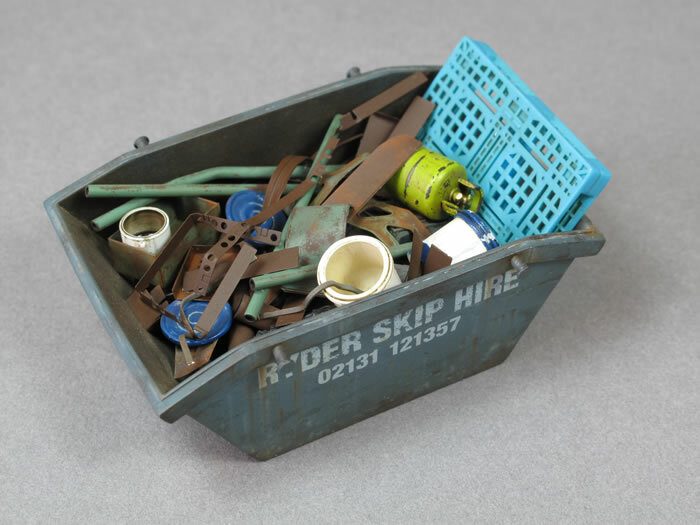 Although the scale is quoted as 1:35, the skips will also be suitable for other scales such as 1:48 and 1:32 due to the wide variety of styles and sizes of the full-sized skips.